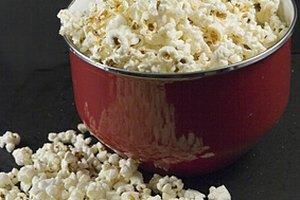 Air popped popcorn is a healthy snack alternative, even healthier than prepackaged popcorn that is loaded with salt, oil and butter. 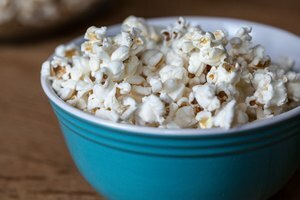 Many people who eat air popped popcorn look for ways to make the healthy snack a little more flavorful. With the right seasonings, you can enjoy a delicious bowl of popcorn and still feel good about your food choice. 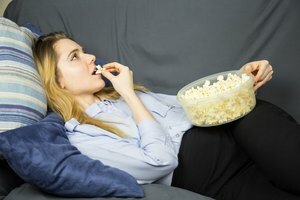 Many people enjoy eating sweet and sugary popcorn. One idea is to toss in cinnamon and sugar and mix it all around. Do this while the popcorn is hot so that the sugar and cinnamon melts into the popcorn. This sweet seasoning idea gives your popcorn a cinnamon-roll aroma and taste and can curb your sweet tooth cravings. Other ideas for sweet toppings include drizzling caramel sauce or chocolate syrup on top of your air popped popcorn. If you do not want to use chocolate syrup -- because of the sticky or messy factor -- consider tossing in chocolate candies, such as M&Ms or chocolate chips. For a healthier version, choose carob chips made from carob powder instead of chocolate. 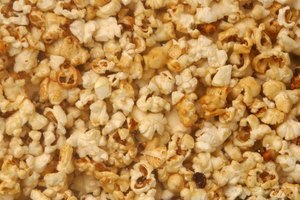 Popcorn is famous for its salty flavor. If you want to give your air popped popcorn a savory sensation, season it with salt and vinegar. Salt and vinegar is a salty combination that is famous for being paired with potato chips. Another savory option for your air popped popcorn is to sprinkle Parmesan cheese and salt on top of it. Garlic powder and black pepper can add even more flavor to your savory popcorn. Of course, you can stick to the classic salt and butter combo, too. If you enjoy spicy foods, like chips and salsa, consider spicing up your air popped popcorn by adding salt, a fresh squirt of lime and a drizzle of hot sauce. This is a low calorie, low fat snack option. Select your favorite hot sauce to use on the popcorn and make sure to mix the contents together well so that the popcorn is coated evenly. You can also create air popped popcorn nachos by spooning nacho cheese on top of your popcorn, followed by sliced or diced fresh jalapenos. If you want a spicy popcorn without having to use sauces or cheese, try sprinkling your popcorn with red cayenne pepper to give it a natural kick. You can pour some of your favorite tangy barbecue sauce over air popped popcorn to give it that smokey grilled aroma and flavor. Some chipotle sauces can also give you a tangy taste. If you want to stay away from sauces, season your popcorn with smoked paprika and chili powder. Those who wish to venture to the more sour side of tangy flavors should consider a salt and lemon juice dressing to drizzle over your hot popcorn. If you don't have fresh lemon juice on hand, substitute it with a lemon pepper seasoning.